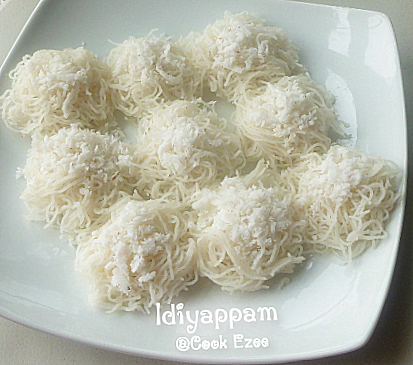 'Idiyappam' or String hoppers is a speciality breakfast of Kerala and I believe in most of the Southern states of India. 'Idiyappam' is also known as 'Nool Puttu' in Malabar, 'Nool' meaning String and 'Puttu' - A steamed cake made with rice flour. For making 'Idiyappams' - rice flour, hot water and salt is mixed and kneaded into a smooth dough. This dough is filled into an Idiyappam presser/sieve and pressed into any plate/banana leaves/Idli maker and steamed for just 5-10 mins. 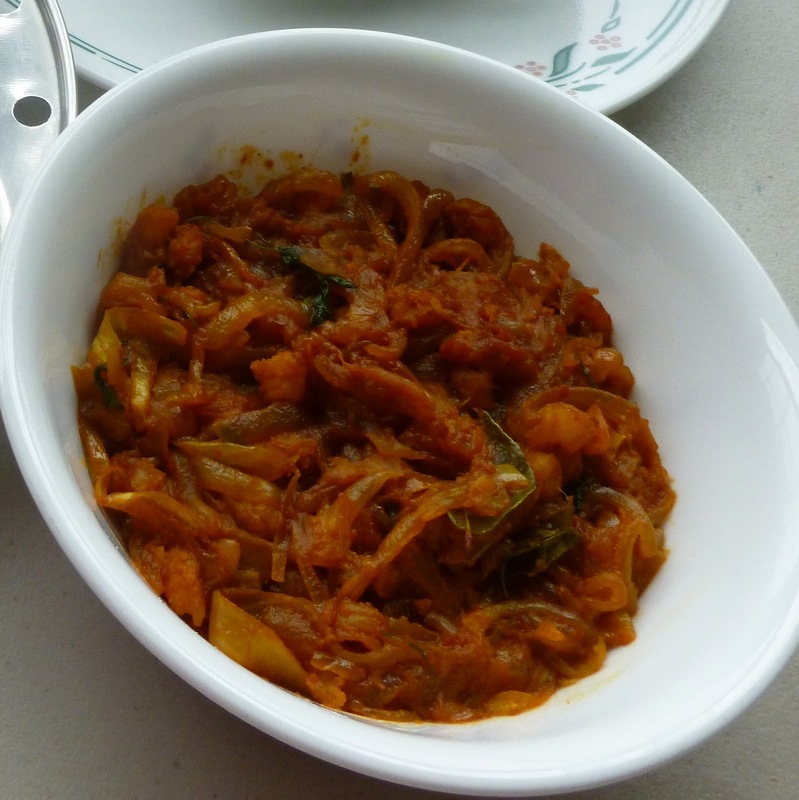 This can be served with potato stew, chana masala, fish, egg or any meat curry of your choice. Back home in Kerala(Malabar-Thalassery) this is even served with sweetened coconut milk and especially kids love this combo a lot. Now as I mentioned this is a breakfast dish and you can even serve this for dinner with any curry of your choice. 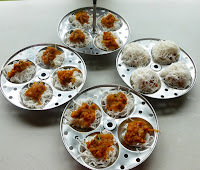 I make it as a snack as well by stuffing shrimp masala and this 'Shrimp masala stuffed Idiyappam' has a topmost place in my son menu list especially to have when he comes back from pre-school. You do not need any curry with these masala Idiyappams and is a perfect snack/appetizer for parties as well. This was my snack for this year's Halloween party and friends gathering and all my friends loved it. So friends I'm sharing with you the recipe for 'Idiyappam' and 'Shrimp masala Idiyappam'. Enjoy!!!! Take rice flour in a mixing bowl or vessel. Pour the hot water to the flour little by little and mix well with a spatula or spoon. Water should be just enough to reach all the rice flour. The rice flour mix should not become sticky by excess water. When the rice flour mix cools down knead it well with your clean hands to get a smooth dough. Press it into the Idli moulds by slowly moving your hands in circular motion. Top with a tsp of grated coconut. Steam for about 5-10 mins. Move into a serving dish when they cool down a little. Serve warm with any curry of your choice. Medium size Shrimp - 15 to 20 numbers. Marinate it with turmeric, chilly powder and salt. Set aside for atleast 15 minutes. Add the shrimp pieces and stir well to mix. Close the pan with a lid and let it cook for another 5 mins till the raw smell of shrimp ends. Fill the presser with rice flour dough and press the mix into the Idli moulds not filling them up fully. Top up with a tsp of shrimp masala. Press the Idiyappam siever again on top of the Shrimp masala to fill the moulds. Repaeat the process with rest of the dough. Steam it for 5-10 mins and take off the flame. 2. Vegetarians can make soya, paneer, tofu or any veggeie of your choice. Iddiyappam is one of my fav.love the idea of stuffing,looks inviting and delicious. looks delicious n lovely stuffed version..yummy !! 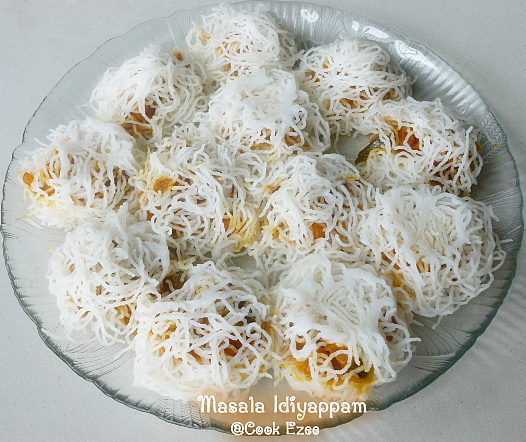 idiyappam looks delicious.. liked your stuffed version as well... glad to follow you.. do visit my blog some time.. Delicious idiyappam with gr8 stuffing..
Intriguing recipe ~ it is a classic n you have recreated it perfectly! this one is new for me .. i will try ..
wow super combo prathiba, idiyappam our family fav.stuffing prawn masala amazing..